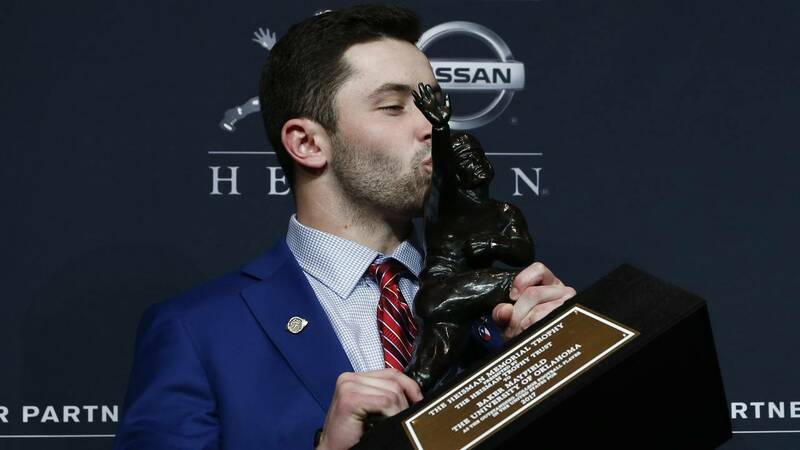 Baker Mayfield, quarterback of the Oklahoma Sooners, poses for the media after the 2017 Heisman Trophy Presentation at the Marriott Marquis Dec. 9 in New York City. Oklahoma quarterback Baker Mayfield won the Heisman Trophy on Saturday. The Sooners' fifth-year senior broke through after finishing third behind Louisville quarterback Lamar Jackson and Clemson quarterback Deshaun Watson last season and fourth in 2015 voting. Mayfield beat out his fellow finalists in Jackson and Stanford running back Bryce Love. Jackson was aiming to become the first repeat Heisman winner since Archie Manning in 1975. The trophy, which goes to college football's most outstanding player, was awarded Saturday night at the Downtown Athletic Club in New York. Mayfield completed 71 percent of his passes for 4,340 yards with 41 touchdowns and five interceptions this season for the second-ranked Sooners (12-1), who will face No. 3 Georgia in a College Football Playoff semifinal at the Rose Bowl on New Year's Day. He also rushed for another 310 yards and five touchdowns. Mayfield started his college career as a walk-on for Texas Tech in 2013 before transferring and once again walking-on for Oklahoma in the 2015 season. The 22-year-old Austin, Texas-native also won the Maxwell, Davey O'Brien and Walter Camp awards earlier this week along with being named the Associated Press Player of the Year.